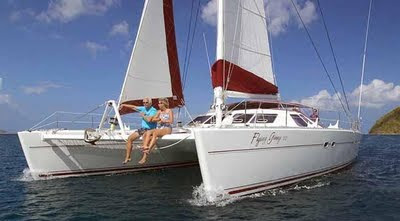 Book Now on the Flying Ginny VII and Save $1000 off listed rates on charters confirmed prior to Nov 15, 2011. (Not including Holidays). Flying Ginny VII, based in the Virgin Islands, is a 55-foot floating dream designed with your needs and pleasures in mind, ready for a week that's tailored to your own taste and preferences. Her experienced crew is dedicated to insuring that you have a vacation of a lifetime by providing for you, in the grandest of style, tempting tropical drinks, fine wines, gourmet meals al fresco in the cockpit, and ample opportunity to satisfy your Caribbean fantasies. You'll be able to relax with a good book, some favorite music, soak in the sun, or dare your spirit with a myriad of watersports and island exploration - you decide.